I've had my Molift Smart mobile hoist for about 6 years now and it has been everywhere. Gone are the days where PA's have to pump the handle and transport a weighty and cumbersome metal frame, this mobile hoist is so easy to use and perfect for me to use when I travel. We had an old manual hoist stored in my parents shed for years as a 'back-up' for my ceiling track hoist at home since my spinal fusion surgery in 2001, and when I decided to move away from home to go to University we all thought it was best to replace the poor thing! I had so many things to consider when buying a new mobile hoist through Direct Payment, at I'm so pleased to say that the Molift Smart really does fit the bill. There's a lot of things I really like about the Molift Smart. I have to really consider the weight and manoeuvrability of this type of equipment for my PA's as ultimately they're the ones who use it. I needed to ensure that a mobile hoist would be easy for a PA to assemble on their own without hurting their back or requiring awkward movement (no lifting!!) which would enable me to travel independently with them. I do not want to have to rely on David or my parents to lug around my equipment, 1 because they're likely to be on holiday too and so why should they when I pay a PA to help, and 2 because I strive to be as independent as possible. 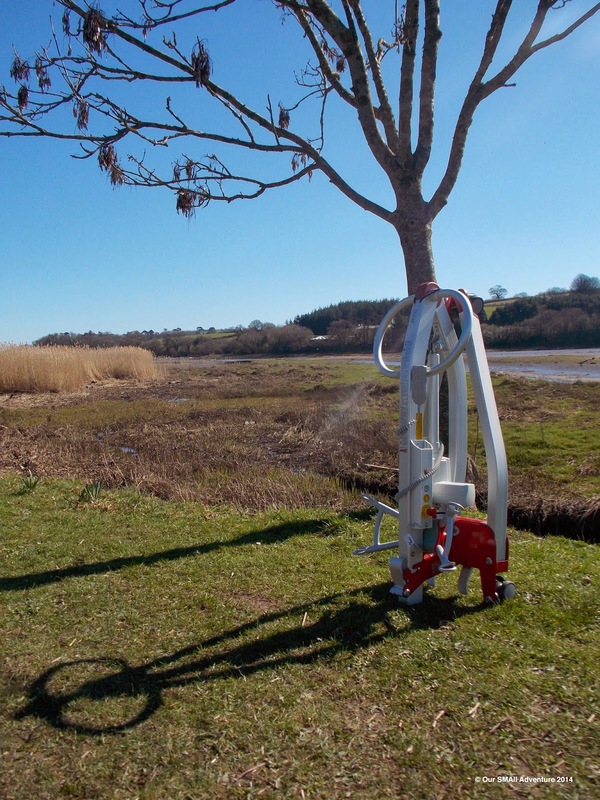 The Molift Smart has a canter-lever system so that raising the main arm whilst setting up doesn't require lifting or trying to align to metal poles like some mobile hoists, this single unit means its easy to transport without heavy lifting. Furthermore, the sturdy castor wheels on the frame are free-turning and therefore can handle many types of terrain. It handles grass with ease as you can see above. This makes it so much easier for my PA's to simply pull the handles as if you would a luggage bag to transport the hoist, no heavy lifting or separate journeys required! Other travel hoists require dismantling for transportation and then fold into a bag, which is something I specifically tried to avoid as I can imagine them being quite heavy to expect a PA to carry. The great thing about having a Molift Smart on wheels is that you can simply roll and go. It happily sat behind me when I had my smaller vehicle, but there is certainly plenty of room in my new van! Another real bonus for me is that this hoist uses a battery rather than a wall plug socket. Hotel rooms usually have limited space and a limited amount of electricity ports, so by having a rechargeable battery it gives me so much more freedom of movement. 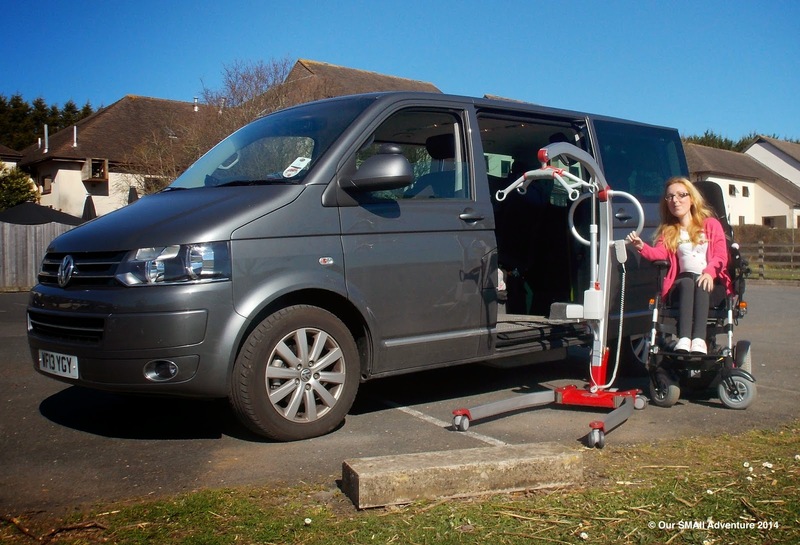 With a wheelchair charger cable, and a pressure relieving mattress cable and pump amongst all the phone chargers, hair dryers and everything else, the hoist can reach all parts of the room without being restricted to a cable length or accessible wall plug socket. I rarely need to charge the battery as I remove it from the socket after each use so that it doesn't drain the battery in wait, and the battery charger can plug in anywhere overnight or when not in use. When discussing mobile hoists we should all be realistic and know what's best for ourselves. Some may prefer a gantry style hoist whereby you erect a structure over the bed similar to a ceiling track hoist. These systems fold down to a similar size as the Molift Smart, but you have to buy and transport the physical 'hoist' separately, so in my opinion its more to carry. I like to be able to use my hoist in the bathroom to, so a gantry style hoist isn't appropriate as it is really only used in one place. Being able to transfer from the bed through to a bathroom in a mobile hoist means that I don't need to take a commode chair with me on my travels, lessening the luggage. In some hotels, you can pop the side panels off built-in baths quite easily so that the hoist legs can side in under the bath itself, as these boards are usually aesthetic fascias, they're simple to clip back on! Whether they make a gantry hoist big enough for a double bed is another matter (I have only seen singles), and I know I'm safe in saying that David would probably hit his head on it at some point. Again, my weight has a big part to play in my love of this mobile hoist. Being lighter, (approximately 40kg) the hoist is easy to push with me in it on carpet and over cables, but heavier clients may need a PA to give more of a push, and, may feel unsteady hanging in the hoist whilst moving, even though it's maximum weight limit is 150kg. The hand control is very light however with easy to press buttons in two speed functions, so it gives me great peace of mind knowing that I can operate this independently while a PA can transfer me. Molift even make a travel case for the Molift Smart, which I did buy originally with the hoist. I have to be truthfully honest though, it isn't ideal but my reasons are justified. It's about the size of a small coffin and is made from a very durable hard plastic. The downside is that you are required to lift the hoist in and out of its case, which totally eliminates my 'no lifting' policy with my PA's. If they had made the end of the case a flap down side, the hoist could be rolled out without any problems. So if you have the money and are thinking of buying the hoist to store as a backup, it's probably a good idea to buy the case and keep it very safe inside. Or even if you're thinking of flying, it might help to keep the hoist safe in the hold (however you may not have a place to store this box on arrival! ), but if you were to plan on using the hoist as I do, I wouldn't say that you need the travel case. I'll quickly add in here, that we often take a few pieces of wood with us to hotels in order to bump the bed up higher in order to fit the hoist legs under if we need to. You can buy bed raisers all over the place and they aren't too expensive, but every bed comes in so many different shapes and sizes, that our simple blocks do the trick just fine. There's always something like a book or magazine in hotel receptions that are great if you need that little bit extra too! These blocks also double up as mini ramps if I need to access somewhere with one small step or UPVC threshold, so I absolutely recommend getting your hands on something similar if you can. Obviously, check with the hotels about the bed before you book, I tend to avoid hotels with Divan beds (obviously beds with legs give more room) as these need to be raised a fair amount for the hoist legs to fit under. Though I have noticed that many more hotel chains are offering disabled rooms with accessible beds, whereby they are already lifted up or they are Divans with a section cut away for the hoist legs to glide in. Times are changing! Finally I'll leave you with my video of how to assemble the Molift Smart from our YouTube channel (subscribe now so that you don't miss our videos on route! ), and it'll give you our extra tips on how we transport the hoist to ensure a smooth trip.